trademark for preparations of verapamil hydrochloride, a calcium channel blocking agent used to treat angina pectoris, hypertension, and tachyarrhythmias. Decreases conduction of sinoatrial and atrioventricular (AV) nodes by inhibiting calcium influx into cardiac and vascular smooth muscle cells, inhibiting excitatory contraction. These effects prolong AV node refractoriness and decrease myocardial oxygen consumption. Adults: Initially, 80 mg (immediate-release) P.O. t.i.d. ; may titrate at daily or weekly intervals to 360 mg/day. Or initially, 180 mg (extended-release) P.O. once daily at bedtime, titrated up to 480 mg/day at bedtime. Adults: 5 to 10 mg (0.075 to 0.15 mg/kg) I.V. 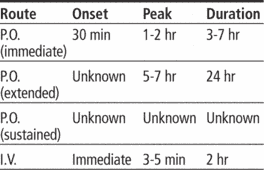 bolus over 2 minutes; may give additional 10 mg after 30 minutes if response inadequate. Or 240 to 480 mg (immediate-release) P.O. daily in three or four divided doses. Adults: Initially, 180 mg (extended-release tablet) or 200 mg (extended-release capsule) P.O. daily at bedtime. For maintenance, may titrate up to 480 mg (extended-release tablet) or 400 mg (extended-release capsule) P.O. daily at bedtime. Or initially, 80 mg (immediate-release tablet) P.O. t.i.d. ; may titrate at daily or weekly intervals up to 360 to 480 mg/day. Or initially, 240 mg (sustained-release capsule) P.O. q day in morning; for maintenance, may titrate up to 240 mg P.O. b.i.d. or 480 mg P.O. once daily in morning. Titrate based on response. • Give I.V. over at least 2 minutes. • Discontinue disopyramide 48 hours before starting verapamil. Don't restart disopyramide for at least 24 hours after verapamil therapy ends. • With I.V. use, monitor vital signs and ECG continuously. • Assess blood pressure when therapy begins and when dosage is adjusted. • Watch closely for signs and symptoms of heart failure. Monitor for signs and symptoms of erythema multiforme (fever, rash, sore throat, mouth sores, cough, iris lesions). Report early indications immediately, before condition can progress to Stevens-Johnson syndrome. • Assess CBC. Watch for blood dyscrasias. • Monitor blood glucose level. Stay alert for hyperglycemia in diabetic patients. • Instruct patient to avoid chewing, breaking, or crushing extended-release form. Advise patient to immediately report rash, unusual bleeding or bruising, fainting, and (in long-term use) fatigue, nausea, or yellowing of skin or eyes. • Caution patient not to take with grapefruit juice. • Instruct patient to limit caffeine intake and avoid alcohol. • Advise patient to seek medical advice before using over-the-counter medications or herbs. • Tell patient to avoid sun exposure and to wear sunscreen and protective clothing when going outdoors. A trademark for the drug verapamil. a trademark for a calcium channel blocker (verapamil hydrochloride). Knowing that his grandfather, a dairy farmer, had long advocated an educational exhibit for kids at the county fair, "I decided that this was a great time to make my grandpa's dream come true," Calan said. Does dim rheswm yn y byd na fedra unrhywun werthfawrogi CD Calan. 2013 and addenda to the contract signed, is provided facilities with medical equipment and furniture multifunctional specific Calan Health Center. McAllister has worked on the development of such major pharmaceutical products as Lupron, Pravachol, Capoten, Kerlone, Cardene, Calan, Avandia, Actos, Teveten, and Atacand. With their contemporary and lively approach, Calan breathe new life into the old traditions through their sparkling melodies and foot tapping tunes along with spirited and energetic performances of Welsh step dancing. Lot 3: Upgrading and refurbishment of six streets in Area Obor Viitorului streets (namely: Berzelor, Sincai Gheorghe, Salciilor, Oltului, Smighelschi Octavian, and Calan Street with approximate total length of 1. TWO leading lights in Welsh folk music will share the stage at St David's Hall on September 22 as Calan and The Gentle Good perform in the L3 Lounge. Bydd drysau'r gwesty yn ail agor ar gyfer dathliadau'r Calan, gydag Aloma yn l yn y gegin a Tony yn cadw golwg ar y dathliadau. In March 2002, Sunrise Telecom acquired and added the CaLan Cable TV Test business from Agilent Technologies to form the second largest test and measurement supplier to the Broadband Cable Industry. 2013 and Addenda to the Contract Signed, Is Equipped with Medical Equipment and Furniture Endowment Specifically to Health Centers Multifunctional Calan. TWO leading lights in Welsh folk music will play St David's Hall on Tuesday as Calan and The Gentle Good perform in the L3 Lounge.